The Envy 5530 Wireless Color e-All-in-One Inkjet Printer prints 8.8 pages per minute in black and 5.2 pages / minute in color (ISO standard). 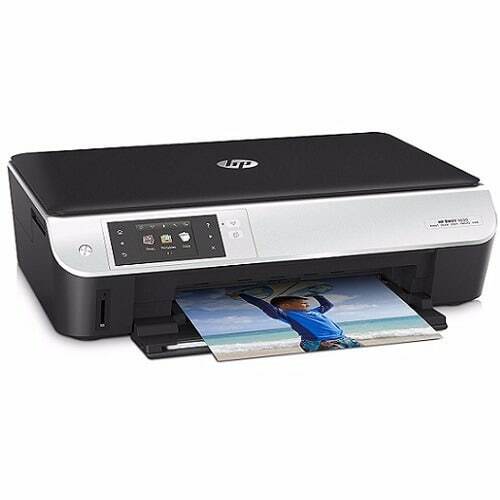 The printer's 1200 dpi optical resolution provides high quality prints with sharp detail while it's two-cartridge ink system (one tricolor and one black), makes replacing the ink easy. Additionally, the printer features automatic duplex printing so you can cut your paper consumption by up to 50%. The printer can handle page sizes up to 8.5 x 14" (legal) and can print borderless photos as large as 8.5 x 11". In addition to plain and photo paper, the printer is compatible with envelopes, card stock, and transparencies. The Envy 5530 makes it easy to print from anywhere. Wi-Fi compatibility allows you to print from anywhere on your wireless network. Save your resources and conserve space by connecting the printer to all your computers. The Envy is compatible with HP's e-Print which lets you print any file or document by sending it to your printer's dedicated email address. In addition to Wi-Fi and e-Print connectivity, the printer is compatible with Apple's Air-Print. Use the SD card slot to print photos from your memory card or to scan files to your memory card without a computer. Additionally, you can print from the web using the 2.65" touch-screen. The Envy 5530 features a flatbed scanner with a 1200 ppi resolution. The scanner's simple interface makes it easy to scan photos and documents up to 8.5 x 11" (letter) in both black/white and color. Using the provided software, you can save scanned images as JPEG, TIFF, Bitmap, and PDF files. The Envy can also function as a standalone copier, allowing you to make up to 50 color or black and white copies at a time.